Great Basin National Park is one of the least visited of our national parks, with a total annual visitors of under 100,000. It is extremely remote in eastern Nevada. The town just outside the park (Baker) has fewer than 100 residents, and the nearest population center is 200 miles away. When driving up the main road into the park, looking back on the valley appears as if one is in an airplane. Over a 12 mile stretch the road goes up nearly a vertical mile in elevation to what I believe is the highest campground in the national park system, Wheeler Peak Campground at just under 10,000 feet. The combination of such a remote location and such a high elevation means this campground is ideal for night photography. Light pollution is not a problem and the usual clear night skies are ideal for viewing the Milky Way. Posters around the park proclaim the slogan, “Half the Park Is After Dark”. Another interesting feature in the Nevada high country is the presence of bristlecone pine trees, the oldest living organisms on the planet. Some of these gnarly trees are thousands of years old. And even after they die, their wood is resistant to rot, allowing the dead trees to remain standing for hundreds or thousands of years after the last needles have fallen. 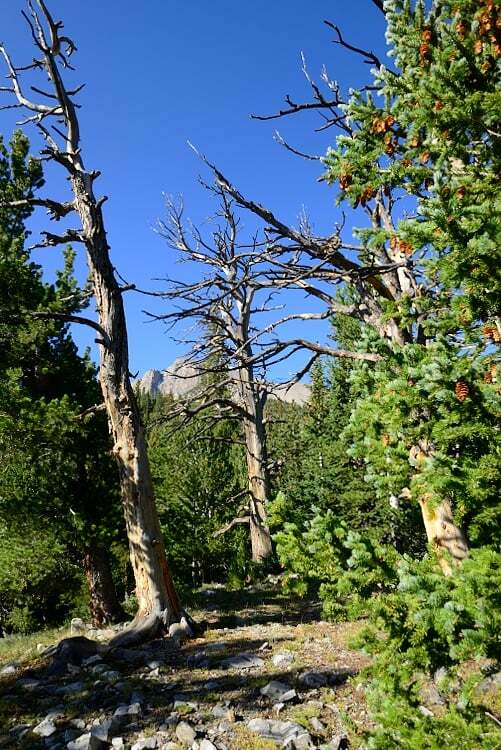 While exploring this wonderful campground along the edge of Lehman Creek beneath Wheeler Peak (the highest spot in Nevada), I found a stand of several dead bristlecone pines. I knew I wanted a shot of the Milky Way lined up with the ancient gnarly tree trunks. Using the phone app Stellarium, I researched what time of night I could line up the Milky Way with these trees. Fortunately the moon would dip below the horizon just a few minutes before the stars were perfect. So I set an alarm to wake up at the right time. The first night I tried there were thin, faint clouds. Stars were visible, but the Milky Way was not sharp. I worried with the moon setting later each night that I might not get the shot I wanted. But the second night I tried was perfect. I got up right before the moon set and waited. I set up the camera and tripod in the woods and lit a propane lantern which I positioned on the ground about 20 feet behind and to the right of the tripod. The warm light of the lantern would illuminate the nearest tree trunk, but not the farther ones. I did a 20 second exposure, which was slightly longer than would normally be recommended for this focal length (32mm on a full frame Nikon D800E). The longer exposure results in slight movement of the stars, but not so much as to create significant trails). The thought that came to mind for the shot was “Old and Older” with the ancient tree trunks paralleling the 13 billion year old galaxy, with its hundreds of billions of stars shining through the clear night sky. The image reminds me of how tiny our planet actually is in this enormously vast universe. 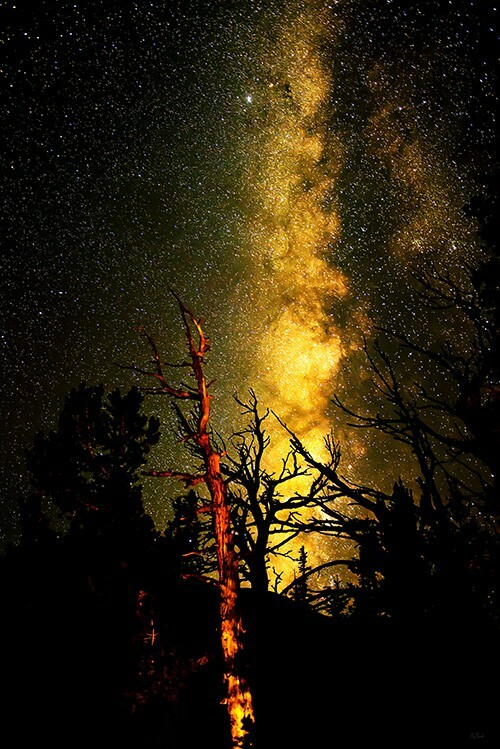 This entry was posted in Uncategorized and tagged across the universe, bristlecone pines, Great Basin National Park, Milky Way, night photography, night sky, Wheeler Peak Campground. Thanks for sharing … awesome pictures … since we can’t get there this is the next best thing. Thank God for our National Parks.